Nearly all airports have a variety of commercial enterprises. For example, all international terminals tend to have monetary exchanges, for obvious reason. All also have some form of duty free shopping with the usual alcohol, tobacco and perfume products. But there is one significant difference that stands out … what they have for food. US terminals have many restaurants, fast food stops, coffee shops, and pastry and ice cream stands, whereas there might be a coffee shop, bar, or small food stand in a South American airport. To go along with the difference in food venues, I also noticed an important difference in the people … in the States , people are significantly larger … or more specifically, there were many overweight people. I rarely encounter and notice overweight people in international airports, but notice many in the States. 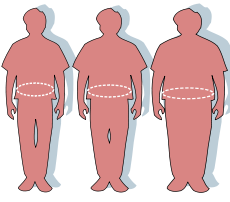 At times, it appeared as though every 2 out of 3 people were significantly overweight. In addition, there were many relatively young people with ambulatory problems using canes or walkers, or riding scooters. Please don’t misunderstand me … I like a good dose of junk food as much as the next guy, and it has a tendency to show up on my waistline, too. I don’t have any problems with people who are comfortable with their weight … whatever it happens to be … and am sympathetic to those who have health challenges that involve diet and weight issues. I’d also like to think that we were meant to come in all sizes, shapes, and colors. To me, that’s part of what makes it interesting to meet people in places like airports. My point is that I couldn’t help looking around the airport terminal and making a connection between what we all understand as a (U.S.) weight problem … or better stated, a health problem … and our culture of overindulgence in over-processed, chemical-laden, fattening foods of questionable nutritional value. I found myself wondering what it was about U.S. culture that lends itself to obesity. I also found myself thinking about world hunger and the children I encounter on the streets in Latin countries who are clearly malnourished and lack sufficient food. I saw the issue of overindulgence and our abuse of food consumption in new ways. Do we really need all of those choices? Do we really need all of that food? What drives our consumption? Is it something we can blame on advertising and corporate malfeasance, or do we need to take greater responsibility, and work toward cultural change? The next time you travel, I encourage you to take the time to consciously observe the world around you. I suspect that like me, you’ll find some things that bring a smile, some that are quite interesting, others that really make you think, and some that give you significant pause.